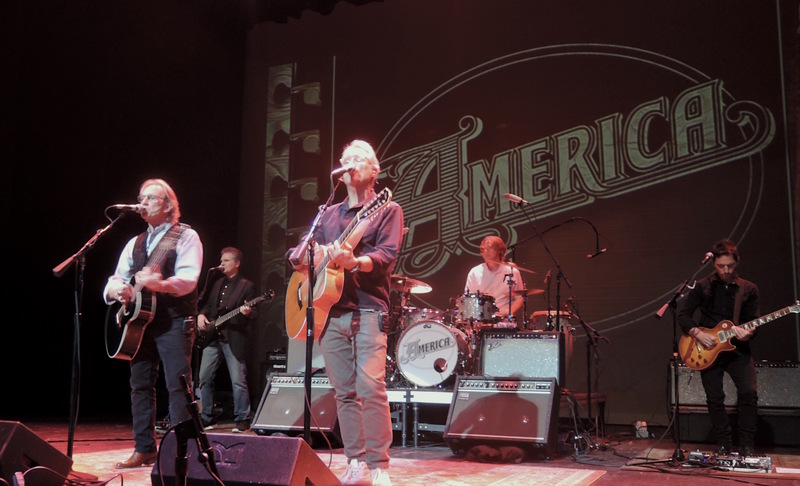 Gerry Beckley of the band America performs during the encore Dec. 7. 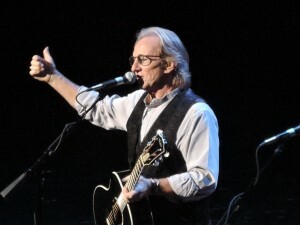 2018, at the Santander Performing Arts Center in Reading, Pennsylvania. 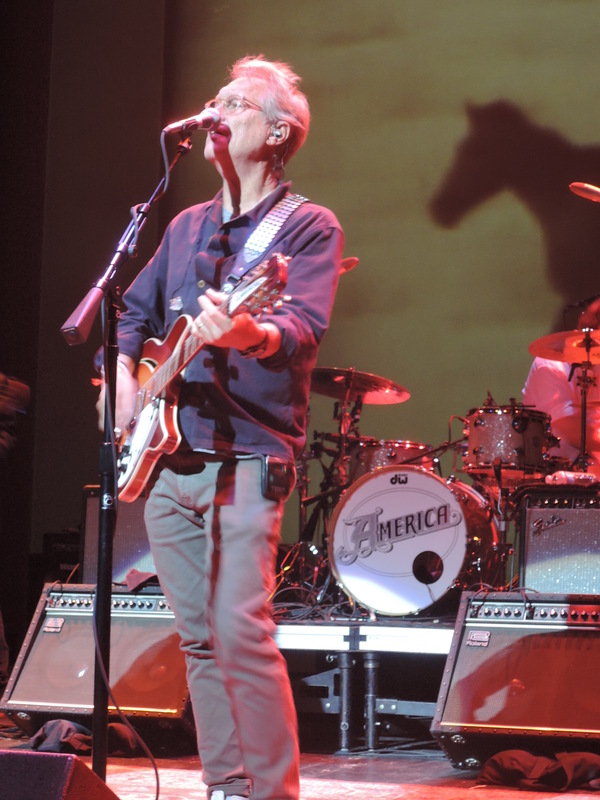 It wouldn’t be an America concert if it didn’t include the mention of George Martin. And the band’s Dec. 7, 2018, concert at the Santander Performing Arts Center in Reading, PA, would be no different. So just how did legendary Beatles producer Martin end up working with the Dewey Bunnell, Gerry Beckley and Dan Peek of America? And what role did bacon and eggs play in that pairing? Bunnell, Beckley and Peek were recording their fourth studio album, Holiday, in 1974 at AIR Studios in London. They were working with Martin, who had produced all of the Beatles’ original albums. Bunnell remembers it as a special time. During the days of recording the album, he and his bandmates would frequent a little cafe in the area or eat at the studio commissary. And they’d frequently eat bacon and eggs. 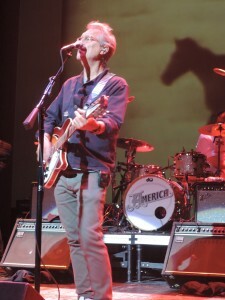 The band’s eponymous 1971 debut album had been produced by Ian Samwell, a British songwriter and guitarist who had worked with Sir Cliff Richard; after relocating to Los Angeles, their second and third albums, Homecoming in 1972 and Hat Trick in 1973, were produced by the band members themselves. 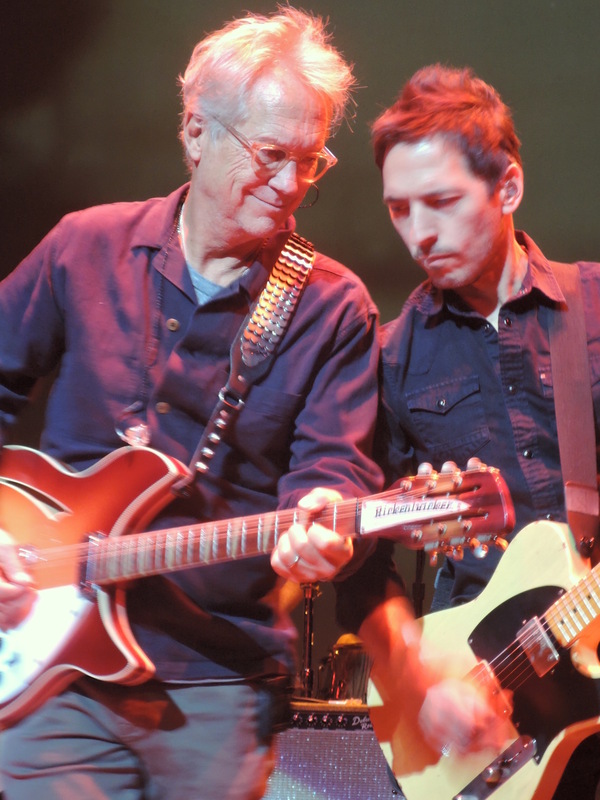 “Gerry and Dan and I produced the second and third albums and we realized we were spending a lot of money,” said Bunnell. “Producing records isn’t just about saying, ‘Oh, that sounds good, let’s put a tambourine on the next track.’ There’s a lot of administrative work and booking studio time and paying bills and all that kind of stuff. “By the time we got to the third album, we said, ‘This is too much work. We need a producer,’” said Bunnell. America was going to start at the top in its search for a producer and was hoping to get Martin to sign on. David Geffen — who had managed Crosby, Stills and Nash as well as Laura Nyro — was also America’s manager at the time. Geffen knew Martin well enough to arrange for him to meet Beckley, Bunnell, and Peek. Incidentally, Geffen would go on to create Asylum Records in 1970, Geffen Records in 1980, DGC Records in 1990, and become one of the three founders — along with Steven Spielberg and Jeffrey Katzenberg — of DreamWorks SKG Studios in 1994. “We were these young whippersnappers and George was coming out of the Beatles thing — it had been a few years since they had broken up — and he was basically available,” said Bunnell. And after working with the Beatles, Martin finished a project with a band called Seatrain, and was looking around for his next project as well. Martin was in Los Angeles for the 46th Academy Awards show when Geffen approached him to meet America’s principals. Martin had scored the soundtrack to the James Bond film Live and Let Die, the title track of which was written by Paul and Linda McCartney. The song was nominated for “Best Original Song” that year, but lost the Oscar to “The Way We Were” by Marvin Hamlisch. 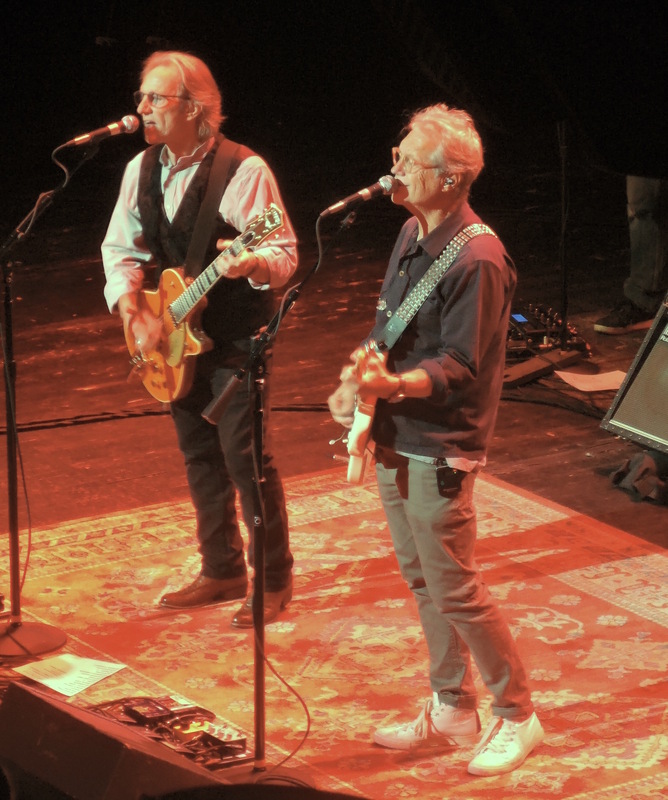 Gerry Beckley, left, of America. Martin met with the band and, according to Bunnell, formed an instant rapport. Bunnell said he thought that it may have been because of a common bond: he, Beckley and Peek were all children of American servicemen who had British wives, and they had first met and formed the band while all their fathers were stationed at the United States Air Force Base at RAF West Ruislip, London. Once they reached an agreement, Bunnell said that the band members wanted to make sure they were ready to record by the time they got to London. They hunkered down and honed and arranged their material, and by the time they did get to London, they were ready to go. Bunnell called the Holiday recording sessions lighthearted but structured. “When we were making the third album [Hat Trick] in Los Angeles at the Record Plant, it was party time,” said Bunnell. “Late sessions. And the Record Plant was a cool place to hang out. Besides the fact that the band was in awe of Martin, Bunnell said that Martin was from a different generation. 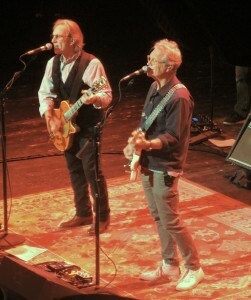 Dewey Bunnell, left, and Gerry Beckley celebrated their 48th year with the band America in 2018. One of Martin’s favorite phrases, Bunnell said, was “Don’t gild the lily.” Martin wasn’t one of those guys who wanted to keep layering stuff on a song. “If you’ve got a nice tasty thing, an overdub or a vocal that works, let’s not bury it under a lot of varnish,” Bunnell recalled Martin saying. The album hit big in the United States and reached No. 3 on the Billboard album chart. It produced two hit singles, the Bunnell-penned “Tin Man,” which reached No. 4 on the Billboard singles chart and No. 1 on the adult contemporary chart; and “Lonely People,” written by Peek and his wife, Catherine, which charted at No. 5 on the Billboard singles chart and No. 1 on the adult contemporary chart. “Tin Man” was based on the general theme of The Wizard of Oz, which Bunnell said has always been, and is still today, one of his favorite movies. “I love that film and the whole premise of people having those things already in them that they seem to be desperately seeking – courage and love and all those things,” said Bunnell. Bunnell likes his songs to paint pictures — and he likes a lyric that takes the listener some place in his own mind within the first few lines of a song. Bunnell thought “Tin Man” had a catchy melody and was a strong enough song — with its chord progression — going into the recording session. Because the songs — especially with Martin’s arrangements — had an old-time feel, Bunnell, Beckley, and Peek decided to wear clothes that reflected a time gone by. They secured an old car from a collector who rented cars for just that purpose — publicity shoots — and headed out to Hyde Park in London. “The costumes showed up, the car showed up, and we shot the cover,” said Bunnell. It was indeed a special and heady time for the members of America. “Right now, as we reach this age, it’s just fun to realize that so many things did happen, and how they are still viable parts of this giant puzzle that is the pop music business,” said Bunnell.